A better film than The Godfather? Francis Ford Coppola’s brilliant The Conversation was made at the height of the director’s powers. Andy Boxall revisits the film. Filmed by Francis Ford Coppola between The Godfather and The Godfather Part II, The Conversation is an homage to films such as Blow-Up, except instead of photography, it deals with eavesdropping and electronic surveillance. Starring Gene Hackman as Harry Caul, it’s a claustrophobic, paranoia-filled psychological thriller, and one of the finest films of the 70s. Harry is a surveillance expert, and has been recruited by a company to record a conversation between an unidentified man and a woman. 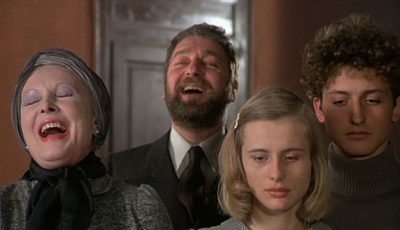 Normally able to maintain indifference towards his subjects, Harry becomes convinced the couple are going to be murdered. Already plagued by feelings of guilt due to a previous job ending in the death of its subjects, he begins to take responsibility for his actions. A very slow, considered film, The Conversation requires patience to fully appreciate, but its many layers make it totally absorbing. Although paranoia is the film’s primary focus, it’s also about devastating guilt, both religious and as a by-product of listening into others lives without their knowledge. The Conversation is shot in such a way that we the audience get to eavesdrop on Harry’s exceptionally private life, with heavy use of stationary, distant cameras intruding on his moments alone. There are many references to people observing or listening to others too, from the mime artist in the fantastic opening sequence, to our own personal interpretation of a particularly oft-repeated line from Harry’s recording of the couple. With so much to explore and consider when watching The Conversation – again, increasing its voyeuristic nature – a second or third viewing is essential. Its connection with Blow-Up is well noted, but its paranoia also recalls Hitchcock’s Rear Window too. 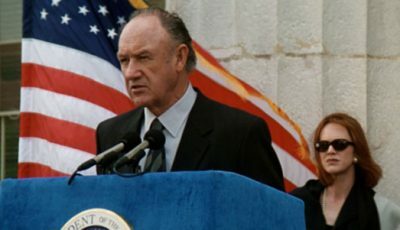 Gene Hackman is superb as Caul, ably supported by John Cazale and Allen Garfield, plus the rest of the cast include a variety of Coppola regulars from that time, including American Graffiti’s Cindy Williams, a young Harrison Ford and even Al Nalbandian in a blink-and-you’ll-miss-it role. The technology on display is fascinating too, with lots of reel-to-reel recorders, big video cameras, rotary telephones and huge audio filters all used extensively. It’s a credit to the film that none of this makes The Conversation feel dated, instead providing a tactile, retro feel along the same lines as Cronenberg’s Videodrome does today. Further mention should go to Walter Murch’s sound design, which the new Blu-ray really brings to the forefront, as it does with the image too. It’s a beautiful transfer that does the film the justice it deserves, and the disc has a good selection of new and old special features. 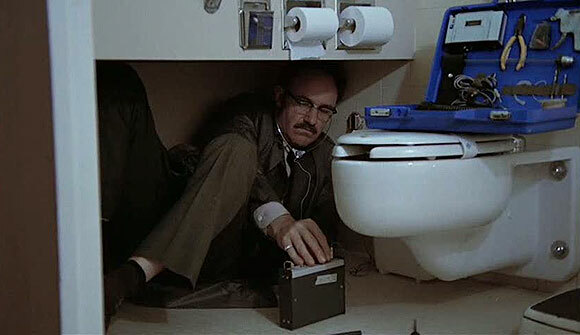 At times horrific (the scene in the hotel bathroom is like The Shining in miniature) and haunting (Harry’s destruction of his room) The Conversation is a bleak examination of surveillance culture in its infancy, as well as a sad portrayal of a lonely man obsessed with keeping his own life private. Troubling and thought-provoking, brilliantly acted and masterfully constructed, this is one not only one of Coppola’s, but also the 1970s, best films. Rather than saying one particular film holds the position of his favourite, Andy has a list of films that “click” with him, including American Graffiti, Videodrome, Grosse Pointe Blank, Ghostbusters, American Psycho and Suspiria. Just added it to my LoveFilm list. 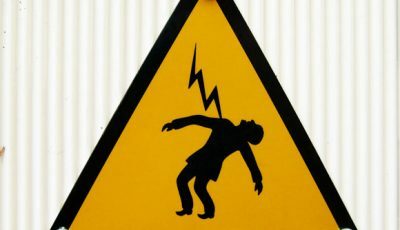 I’ve heard of this before but never seen it. I love The Lives of Others, which is a smilar idea, and if this is as good as you say then I really must see it. One of the greats. Better than the Godfather? Controversial. If they were both on my DVD shelf I’m pretty sure I’d choose this one to rewatch first, so maybe it is. Excellent choice for a topic of conversation! 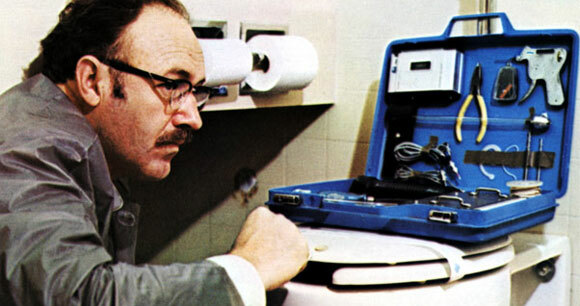 Not only does ‘The Conversation’ have at its core Gene Hackman’s best, most understated roles. The film is a treat for those who like to take the time and absorb its nuances and revel in the realm of suspense tinged atmosphere. And palpable paranoia delivered through quiet intimidation provided by Harrison Ford. Hitchcock would have been pleased with Coppola’s efforts. Oh, BTW. This film was ROBBBED at the Oscars! I love films where paranoia fuels suspense. I just added this to my Netflix queue. I love this film. Hackman is brill. I just saw this recently. It’s a bit on the slow side but it’s definitely a good movie, Hackman was brilliant. I just bought this on Blu Ray, and I think his is Hackman’s best performance, because for the first and only time in his career, he shatters his typecast and doesn’t play the overbearing, bullheaded alpha. Yet to see the DVD or Blu Ray version of this, which means I haven’t been exposed to the full glories of Walter Murch. What I’ve always found interesting is the fact that when this was initially released in Perth (Western Australia) during the 1970s, it was part of a double bill with The Parallax View. This was rare – at the time double bills in the local cinema (as opposed to the drive-ins) were pretty much non existent. So why did this happen? Well, apart from the fact they were both films about paranoia, it linked the eavesdropping Nixon era with the assassination conspiracy one of the previous decade, when JFK’s murder was still up in the air. Perfect marketing for a bored 1970s audience sitting on the edge of the empire, I guess. Pity Gordon Willis didn’t shoot both films – that might have provided some kind of underlying connection. Interestingly, The Conversation was shot by Bill Butler, the man who photographed Jaws. Any explainable connection, Dan?